Rakin' 'em In! is a battle minigame found in Mario Party 2. When the minigame starts, the round table starts spinning slow as there are types of Mushrooms on the round table. 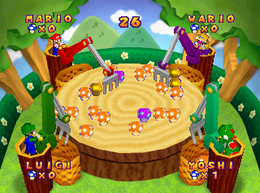 Players have to grab the Mushrooms by using a mechanic claw to grab them into their baskets. A regular mushroom has one point, a Golden Mushroom has three points and a purple mushroom takes away three points. The player who gets the most points win 3/4 of the other's Coins. Game Rules – "Many Mushroom sit atop the spinning stump. Use your crane to rake in as many as you can!" Advice – "Gold Mushrooms are worth 3 normal Mushrooms, but Poison Purple Mushrooms are worth MINUS 3 Mushrooms!" Spanish ¡Bárrelos a todos! Sweep all! Italian Pigliali tutti! Take all! This page was last edited on November 9, 2017, at 08:17.